Skin bleaching (whitening) is a cosmetic procedure that many people use to lighten the color of their skin or to correct imperfections in the skin. Chemicals are often used to attain a lighter skin tone or to provide a more even complexion. This is done by breaking down the concentration of melanin. It is important to make sure the skin lightening substance used is safe and non-toxic. The costs associated with skin bleaching vary greatly depending on the chemicals used. Some people use chemicals at home and others decide to go to a dermatologist in order to have their skin bleaching done. There are different methods that people use in order to lighten their skin including chemical, natural and laser. Skin bleaching using chemicals may be risky because of the hazardous compounds used. Chemicals will provide the fastest results but they also have the most side effects from allergic reactions or misuse. Some skin lightening treatments also reduce or block out the amount melanin production. These treatments use a combination of topical lotions or gels that contain melanin-inhibiting ingredients along with sunscreen. Exfoliates, chemical peels and lasers may also be used to lighten the skin. There are also new procedures that utilize LED systems that reduce health risks and have great results. Hydroquinone is a commonly used topical ingredient used for inhibiting melanin production. It does not bleach skin, but lightens it. Concerns about hydroquinone’s safety have been expressed because in high concentrations it creates a negative reaction with the skin. It is usually mixed with cortisone which acts as an anti-inflammatory. This method is inexpensive, but is not the safest. More natural products are available including Arbutin which is derived from plant leaves and pears. It has melanin-inhibiting properties that are considered safe depigmenting agents. Kojic acid has been shown to be very effective when it comes to inhibiting melanin production. In the sunlight it can turn brown and lose it efficacy. It is not a carcinogenic, but can cause allergic dermatitis and skin irritation. Depigmentation in skin is commonly linked to individuals born with vitiligo, which creates differing areas of light and dark skin. Many individuals suffering from vitiligo will use a topical cream containing the organic compound monobenzone which lessens the remaining pigment. Laser treatment has a profound effect on the skin, but is expensive and results are inconsistent. Cryosurgery using liquid nitrogen is also used because it causes destruction of the skin cells which will then naturally regenerate themselves. Excess melanin come to the surface and then peels off in a few days. This is used in sensitive areas where laser treatment could cause a scar. Freckles are often treated using this method. Chemical bleaching poses the greatest risk to the skin. This method can result in chemical burns and allergic reactions. The burns and allergic reactions can take weeks to properly heal. Using chemicals without medical supervision also increases the risk of harming the eyes and can be deadly if ingested. Some chemicals that are used in skin bleaching have also been linked to cancer. Some skin lightening creams contain carcinogenic compounds which are very dangerous to one’s health. To minimize risks involved with skin lightening look for products that are toxic-free. There should be minimal recovery involved with skin bleaching. Many will notice that the skin is sensitive and slightly red. The amount of recovery depends on the type and extent of skin lightening. It is always best to have a professional help you to minimize risks. Do not go in the sun, tanning beds or use any creams that may cause darkening of the skin. Follow after-care instructions to prevent any undesired effects and promote healing. 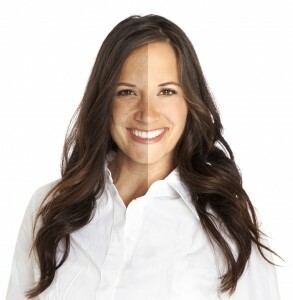 Skin bleaching may take multiple sessions in order to get your skin the color you desire. Make sure that you allow enough time between treatments so that the skin has time to repair. If you notice any irritation to the skin make sure to contact your doctor.